This sample project implements the class MultipagePrintDocument that inherits from System.Drawing.Printing.PrintDocument to print multiple pages of a document per sheet. The constructor of MultipagePrintDocument accepts an instance of TXTextControl.TextControl that is used to create the page thumbnails in the printing process, the number of pages per sheet and a boolean value to specify whether the light gray border should be printed or not between the pages. The overridden method OnPrintPage contains the main logic and controls the printing process. 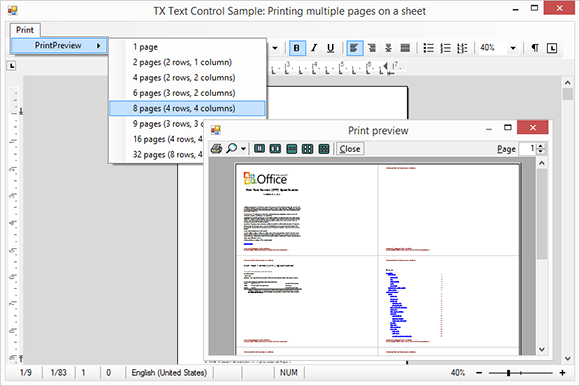 Based on the specified number of pages, the width and height of the available columns and rows per sheet are calculated and for each page, a thumbnail image is created using TX Text Control's GetImage method. The image is scaled to the width of the defined columns to create a multipage document. Finally, the created Metafile images are rendered on the Graphics object of each page in the PrintDocument.